FOUR bands from the Australian Institute of Country made the best use of the recent long weekend and did what musicians like to do - they went on tour. Both Gayndah and Mundubbera are still suffering the effects of the floods from earlier this year and the tour proved an ideal opportunity for the AICM students to help. 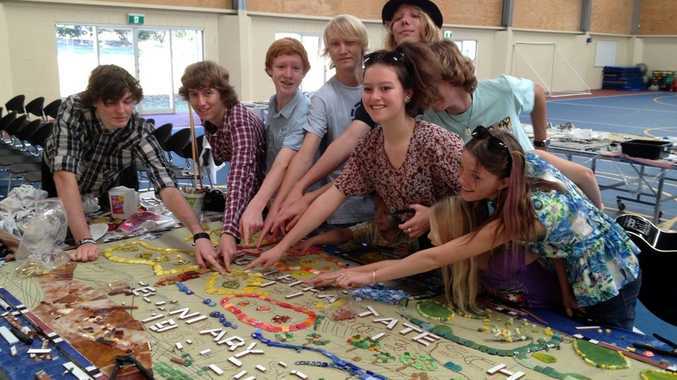 The Friday saw two bands, Playback and Two & Fro working with students at Burnett State College at Gayndah. They learned a couple of songs with the Gayndah students and performed them for a whole school assembly in the afternoon. The bands travelled to Mundubbera and were joined by two more bands from Gympie - Caitlyn Shadbolt and Aiming High and Something in Latin - for the Friday night fund raising performance in the Mundubbera Golf Club. AICM student Amellia Winkley compered the program. The fundraiser was in aid of the Mundubbera centenary and the Gympie bands did an outstanding job by thrilling the locals with their range of talent and professionalism. "It was amazing," said Mundubbera school music teacher and organiser of the event, Kirsty McGovern. "The good bands just kept coming". After sleeping in the Mundubbera State School classrooms and eating breakfast provided by the school, AICM students were thrilled to be invited to be part of the centenary mural that was being constructed in the brand new school gymnasium. Each student cut a piece of glass and placed it within the mural. The Gayndah Orange Festival was well and truly under way by the time the group returned to Gayndah and, with their gig on the main stage between 1-3pm, the Gympie students had time to watch the impressive parade before preparing for the afternoon show. It was another opportunity for the Gympie students to display their talents with a good-sized crowd stopping and listening at all times.